Instead of writing your own formulas in calculated fields, you can use Show Values As to quickly present values in different ways. It also provides several new calculation options, such as % of Parent Total or % Running Total In. Tip: You can use this feature to try different calculations in a value field. 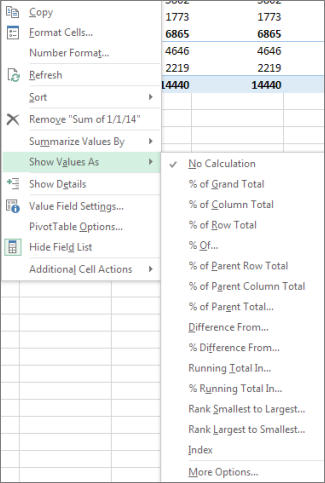 However, because you can add the same value fields to a PivotTable more than once, you can also use this feature to show the actual value and other calculations, such as a running total calculation, side by side. In the Field List, drag the value field that you want to add to the Values area that already contains that value field, and then place it right below that field. Note: The value field is added to the PivotTable and a version number is appended to its field name. You can edit the field name as needed. Repeat step 1 until you have displayed all the value fields you want to calculate by using Show Values As. Click the calculation option that you want to use. Displays the value that is entered in the field. Displays values as a percentage of the grand total of all the values or data points in the report. Displays all the values in each column or series as a percentage of the total for the column or series. Displays the value in each row or category as a percentage of the total for the row or category. Displays values as a percentage of the value of the Base item in the Base field. Displays values as the difference from the value of the Base item in the Base field. Displays values as the percentage difference from the value of the Base item in the Base field. Displays the value for successive items in the Base field as a running total. Calculates the value as a percentage for successive items in the Base field that are displayed as a running total. Displays the rank of selected values in a specific field, listing the smallest item in the field as 1, and each larger value with a higher rank value. Displays the rank of selected values in a specific field, listing the largest item in the field as 1, and each smaller value with a higher rank value. To show calculations side by side with the values they’re based on (for example, to show the % of Grand Total next to the subtotal), first you need to duplicate the value field by adding it more than once. In the Field List, drag the field you want to duplicate to the Values area, and place it right below the same field. In the example shown above, three value fields were added a second time to the Values area; they have "_2" appended to their names. 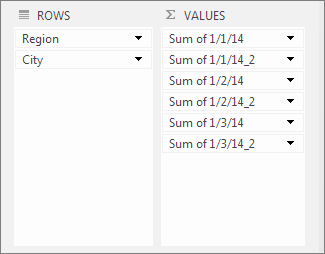 Below, the "Sum of 1/1/14" field is shown twice in the PivotTable report, so you can see the value for each city and their parent (the East or West region). You also see the percentage of the grand total for each region (in rows 6 and 9).